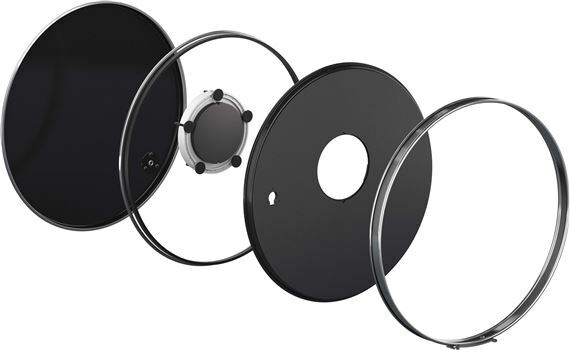 Order your Roland KDA22 Kick Drum Converter Trigger Pad 22 Inch from AMS and enjoy 0% Interest Payment Plans, Free Shipping, Free Extended Warranty & 45 Day Money Back Guarantee. Take your favorite 22" acoustic bass drum and convert it into a trigger for your V-Drum module. If you love the look and feel of your traditional acoustic bass drum, the Roland KD-A22 Kick Drum Converter lets you incorporate it into your V-Drums setup. This new trigger package fits to a standard 22-inch acoustic bass drum, giving you striking stage presence and acoustic-style feel thanks to Roland’s innovative air-damping mechanics working alongside the deep drum shell.